It will be St Michael’s who will entertain the prospect of a Senior-Junior Cup double as they qualified to face Blackrock back at Energia Park next Wednesday. Gonzaga had to get out to a solid start and this was made redundant when captain Zach Baird barged over from a maul for Fintan Gunne to convert for 7-0 in the 5th minute. It was double trouble when Gunne sent wing Tiernan Hurley through for the second try in as many minutes. 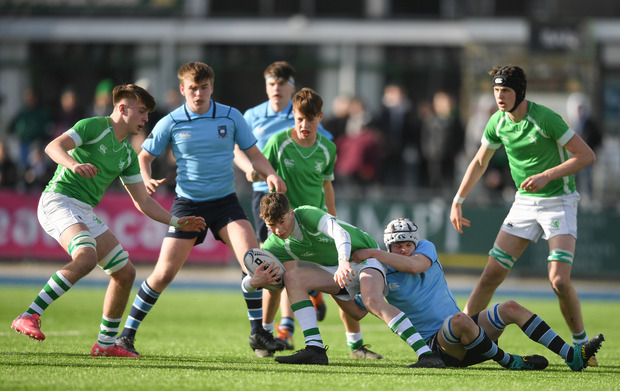 Gonzaga almost struck back when their forwards were unable to ground the ball before St Michael’s wing Daniel Whelehan sped to the right corner for Gunne to make an improbable conversion. The bounce back came from centre Hugh Goddard’s gather of Davy Colbert’s delicate chip, answered by Gunne’s penalty for 22-5 at the break. Gonzaga engineered a lorry load of penalties without making the breakthrough, although St Michael’s centre Sam Berman was binned. Full-back Hugo McLaughlin shattered the defence through the middle and joint-captain Luka Hassett torched St Michael’s up the left to finish. It was a pity as Gonzaga dominated the second period without breaking a superbly organised defence until Hassett struck in injury-time in what was too little, too late. At Energia Park – ST MICHAEL’S COLLEGE 22 (Z Baird, T Hurley, D Whelehan try each; F Gunne pen, 2 cons); GONZAGA COLLEGE 10 (H Goddard. L Hassett try each).